I'm in the middle of a big downer kind of week. I should have known it was coming. Dan and I started a detox (no soda, no carbs, and no sugar) yesterday. I didn't get the job I interviewed for last week. I'm feeling stressed out and worried about most everything. And, I want out of Mississippi NOW. I just want to run away and go home. I probably shouldn't be so honest on my blog. But, I don't care anymore. I'm cool with admitting that my world isn't perfect and I'm not always a happy lady. Janeane Garofalo and John Goodman are my best friends today. 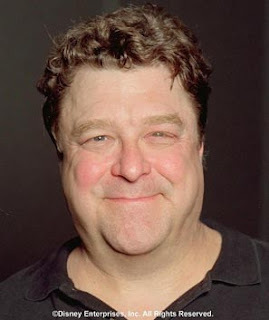 If I can giggle about a John Goodman jig and laugh at Janeane talk about matronly upper arms then I think I'll be okay. Sorry to hear you are having a bummer of a day. Good luck with the "no" diet. I'm sure it is a bummer week especially with Dan back in school and your sister gone. :( Hey, tomorrow (wed) is a "no drive" day for me so the kids and I plan to spend the morning at our pool. Come join us! I know you're not a big hot weather kind of girl, but the water is nice and cool and we could make some fruit smoothies (does that fit in the detox, I don't know? maybe some veggies and hummus...)and just relax! Let me know if you're interested! You should watch Always. It's hard to be sad when you're watching John Goodman slurp the cream out of a twinky with a straw and get drenched in red fire extinguishing stuff.